We were drifting off to sleep when something woke us. The next thing we knew the door bell was ringing frantically, and I rushed downstairs to open the door. Our neighbour from the other side of the cul-de-sac was standing there, looking pale and shocked. Mobile telephone in hand, she was giving her name and address to someone. To me she said - “my husband’s over there...”, and pointed to their car, arranged at an untidy angle in the road but apparently undamaged. I still hadn’t the faintest idea what was going on - what connected these disjointed and agitated fragments of information. I found her husband in the back of their car, also looking shocked, and huddled alongside him was their three-year-old daughter. “Come inside”, I said, and held open the car door for them. It was only then, as I glanced over at their house, the front door wide open and light streaming out, that I noticed the silver car. It was impaled in the side of their house, slightly off the ground, and only the rear half was visible. The smell of gas was very pronounced - the car must have fractured the gas supply to the house. No sign of fire, though … yet. Within minutes the police arrived. They took the young lad into custody, and called for a police dog handler to help find the driver who had run off. Because of the fire risk, the fire brigade was called and two fire engines arrived on the scene. They checked the stability of the badly-damaged house and then called a gas engineer to come and seal the leaking gas pipe. The driver was found and also taken into custody. He was 15 years old and drunk. The two lads had stolen the new car of the mother of one of them, and lost control on the bend just before colliding with the house. After the gas pipe had been sealed, a recovery truck winched the significantly shortened car from the side of the house and onto a trailer. The emergency crews and their vehicles began to leave the scene and gradually the cul-de-sac became quiet again. Our neighbours returned to their damaged, unheated home for the remainder of an uneasy night, knowing that in the morning they must face the tasks of clearing up, calling in the insurance assessor, arranging for the builder to come and shore up the ruptured wall before rebuilding, attending the court case and so on. No doubt they would experience weeks of disruption through the reckless actions of the two lads. We felt really sorry for them - they had moved in only two months before. Although the human body is vulnerable to injury, it is well protected by a range of structural and behavioural strategies. The skin is tough and resilient, resisting wear and tear and preventing the entry of infectious micro-organisms. Vital internal organs such as the brain, heart and kidneys are well-protected by bones and layers of soft tissue. The nervous system anticipates potentially dangerous situations and sets in motion behaviours that will move us to safety. Occasionally, though, these strategies are inadequate, and the body is damaged. Injury to the coverings of the body increases the risk of infectious organisms gaining entry to the tissues and fluids of the body where the warm, salty, nutritious and wet conditions are ideal for their proliferation. When an injury or infection occurs, the body responds quickly to try and limit further damage and then put things right as far as possible. Living tissues have the ability to repair themselves - if not completely, then at least to the point where normal functioning of the remaining tissues can continue and the risk of infection is reduced to normal levels. In every day life, an emergency such as a car crash or a household fire results in the arrival of teams of specially-trained people to deal with the immediate situation, followed by those who tidy up the mess and make repairs. The body uses a similar strategy, making immediate changes to limit blood loss, calling in teams of specialised cells to deal with the dead and dying cells at the injury site and any potentially harmful micro-organisms that may have gained entry, and then setting in place cells that will repair the damaged tissue and close over any boundaries that may have been breached, for example in the skin. The steps in this process are called haemostasis (literally - ‘stopping the blood’), inflammation, proliferation, and remodelling. In emergency situations, whether we are thinking about the people or cells involved, communication is the key. When we are involved in an emergency, we call on help from those nearby and also use a phone to call in the emergency services from further afield. Cells affected by an injury signal their distress to each other both locally, mainly by releasing signalling molecules, and at a distance, mainly by nerve impulses. As far as we know, these cellular responses to injury arose early in evolution, a reflection of their vital role in survival. In some species, extensive regeneration of damaged or lost tissues can be achieved, replacing like with like. For example, a lizard may shed its tail in order to escape capture by a predator, and then grow a new tail complete with vertebrae, muscles, and nerve supply. However, in adult humans only a few tissues are able to regenerate effectively. Thus, damaged skin can regrow, and within certain limits the liver can regenerate lost tissue. Broken bones can mend themselves. In most human tissues, though, wounding results in the formation of scar tissue that holds everything together effectively but which does not function in the same way as the lost tissue. When tissues are injured, there will usually be some bleeding. Highly vascular tissues such as muscle will bleed for longer and there will be a greater escape of blood into the tissues, while other less vascular tissues such as ligaments will bleed less. However, several rapid reactions to injury will ensure that blood loss is minimised. For example, damaged blood vessels have a tendency to go rapidly into spasm soon after injury: smooth muscle fibres in the walls of the vessel contract, and this causes the blood vessel to become narrower. In this way, the amount of blood flowing through the vessel and escaping from the damaged region will be reduced. Then, platelets set in motion the clotting cascade that will seal off the damaged blood vessels. Platelets are specialised fragments of cells that circulate in the blood, generally in an inactive state. They are formed by large cells in the bone marrow called megakaryocytes (mega - big, karyo - nucleus, cyte - cell). As soon as platelets encounter damage, for example a roughened surface in the blood vessel they are passing through, they become activated. They become ‘sticky’, clinging on to each other and to the damaged tissues, and at the same time releasing powerful chemical signals. The growing platelet plug helps to slow the flow of blood from the damaged vessel, but is unlikely to completely stop blood loss on its own. So the platelets organise another reaction - clotting of the blood. The chemical signals released from the platelets cause the production of a protein enzyme called thrombin. This changes a soluble material in blood - fibrinogen - into a fine meshwork of insoluble fibrin. The fibrin mesh strengthens the aggregated platelets and traps escaping blood cells, forming a blood clot or thrombus. The larger thrombus is much more effective at blocking the escape of blood than the platelet plug. The platelets also secrete chemical signals known as cytokines that will set in motion the next phase of the injury response - inflammation. 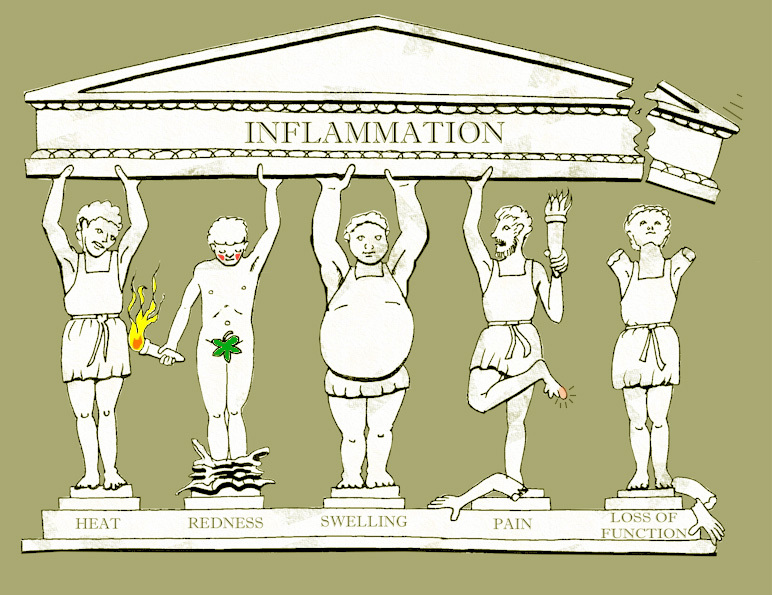 Inflammation is a universal response by the body to injury, regardless of whether the injury is caused by trauma, mechanical irritation, thermal or chemical insult, or an immune response. It is a normal and essential stage in wound healing. It is a process characterised by swelling, redness, pain, and warmth in the affected region, and a loss of normal function. The inflammatory phase has a rapid onset in the first few hours and reaches its maximum in 2 to 3 days before gradually resolving – usually - over the next 2 or so weeks. The process is initiated, maintained, and terminated by complex sequences of cytokine signals between the cells involved. Failure to resolve the inflammation can lead to chronic non-healing wounds. During inflammation, the undamaged blood vessels near the injury site become leaky and release plasma and blood cells into the surrounding tissues. This cell-rich fluid is called inflammatory exudate. The exudate dilutes any irritant substances that may be present in the damaged area and often a fibrin mesh forms within the exudate. The meshwork traps particles and debris, and provides a framework for the activities of incoming cells. Large numbers of white blood cells called neutrophils (also known as polymorphonucleocytes because of the irregular shape of their nuclei: poly - many, morpho - shape, nucleo - nucleus, cyte - cell) are attracted to the injury site by the chemical signals released from damaged cells. The neutrophils begin the process of cleaning up the debris of dead and dying cells and also attempt to dispose of any micro-organisms that have entered the wound. They are aided in this process by the local mast cells. Other cell types begin to arrive on the scene. White blood cells known as monocytes when they are circulating in the blood stream leave the blood vessels and migrate into the wound area, changing into macrophages (‘big eaters’) as they go. The macrophages help the neutrophils clean up the wound area by removing dead and dying cells and any fibrin mesh and clot residue that has become unneeded. The macrophages are rather like the ‘contractors’ of wound healing - they phagocytose and also co-ordinate the activities of other cells in the vicinity. A few days after the initial injury, specialised cells begin to repair the damaged tissues by creating scar tissue. Fibroblasts secrete a scaffolding of collagen on which further repairs can take place. Some of the fibroblasts pull the edges of the wound closer together, a process called wound contraction. Other cells, pericytes, create a network of new capillaries within the wound area. This process is called angiogenesis. The healthy pink tissue that is laid down during the proliferative phase is called granulation tissue. Skin cells grow in from the edges of the wound and in time will differentiate to form a new epidermis. The proliferative phase reaches its peak some 2 to 3 weeks post injury. The remodelling phase changes the richly vascularised granulation tissue into a more mature, less vascularised scar. The initial deposition of collagen during the proliferative phase produces relatively weak fibrils with a random orientation. As the scar tissue matures and is remodelled, the original collagen is replaced with a stronger form of collagen oriented in relation to the lines of stress being experienced by the tissues. The remodelling process begins while the proliferative phase is proceeding, and may continue for many months. By the end of the remodelling process, the scar tissue has become paler and reduced in size, and successfully holds the tissues together. To see some questions about inflammation, click here.